Because I’m a little terrified of the exhibits hall, I rarely find anything of interest in the deluge of pre-Annual mailbox fodder. 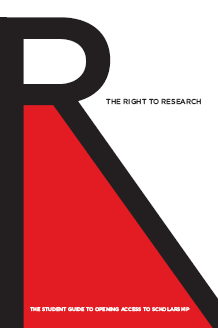 Yesterday was an exception – SPARC, one of my favorite organizations (judged in part on the strength of its acronym – the Scholarly Publishing & Academic Resources Coalition) sent a mailer introducing its new initiative, The Right to Research: The Student Guide to Open Access to Research. 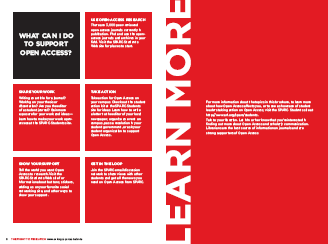 Billed as a “way to engage students on the topic of access to research,” the initiative forwards Open Access as a principle for students to consider and support. I love this idea, and am interested to see if the initiative can help librarians and educators stimulate student interest in open publishing and accessible research. My least favorite part of information literacy instruction is telling students that their access to scholarly resources is temporary, and based almost totally on their active (aka $$-based) association with a college or university. The Open Access movement should be a natural sell from a student perspective (if not necessarily an easy one). Campaign resources range from a student-directed blog to links for various brochures and publications, a few pages of which I’ve included in this post. As you can see, they are extremely well done. Speaking of which – highest marks to SPARC for consistently creating such well-designed websites and publications. “They won’t buy it if it’s busted” is a motto that applies particularly well to students, so hats off to SPARC staff for upping the communciations ante in our field – somebody’s got to do it. SPARC also recently announced the second year of their video mashup contest – the SPARKY Awards invite students to create a video that communicates the value of information for a $1000 prize. Winners of the 2007 awards are available online. no problem – keep up the good work.